Trying whiskey in a tasting setting rather than one by one is a great way to sharpen your palate, compare samples directly, and have some fun with friends. 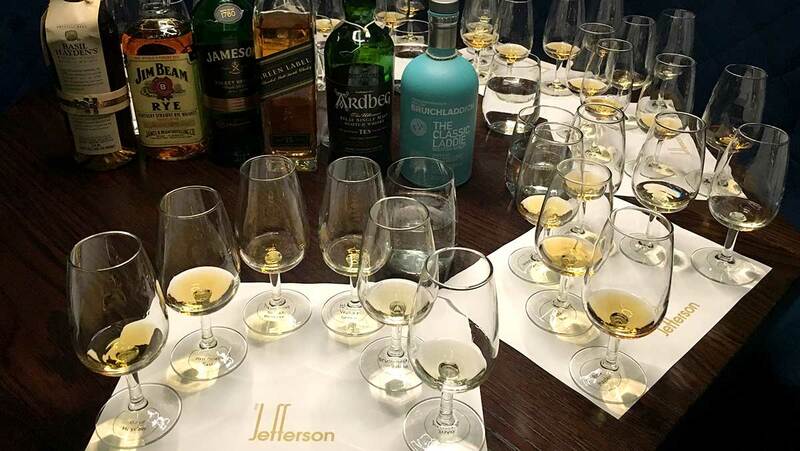 We all need to start somewhere, and there is no better introduction to the world of whisky than a guided tour with the experts at The Jefferson. From grain to still, barrel and bottle, experience Auckland’s finest whiskey selection. The Jefferson offers a range of whisky tasting to help you create the perfect experience. On the last Wednesday of every month, The Jefferson Social Club meets for a whisky tasting. 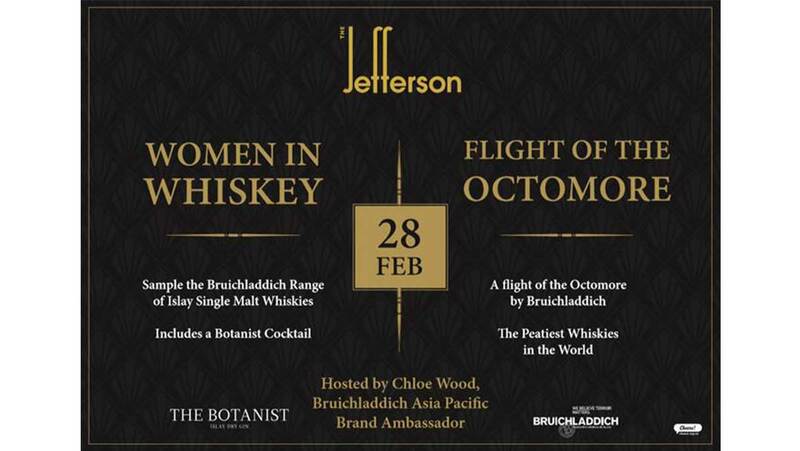 This month, The Jefferson presents His and Hers Whisky Date Night on Wednesday the 28th February, hosted by Chloe Wood, regional brand ambassador for Bruichladdich, all the way from Islay, Scotland. Bring a date as this tasting will have two sessions. In the first session at 7 pm, ladies will enjoy a Botanist Gin cocktail on arrival followed by a Bruichladdich whisky tasting. Then head to the bar and enjoy a flute of the newly released Mumm Grand Cordon Champagne while the boys sit down for the second session. In the second session at 8 pm, the guys will enjoy an Asahi Black beer on arrival and will then sample the flight of the Octomore which is made for all you peat lovers out there! You will taste the 8.1 and 8.2 editions which are not yet available in NZ so this is truly a privilege and opportunity that you do not want to miss! To secure your spot email rsvp@thejefferson.co.nz. Tickets are $80 per session or $130 for both sessions. This will sell out so don’t miss out! Thanks to our friends at The Jefferson, use the code #fashiontvnz to receive a complimentary glass of champagne. Number of guests: Suitable for a group of 4 or more people. This tasting caters to new and experienced whisky drinkers. 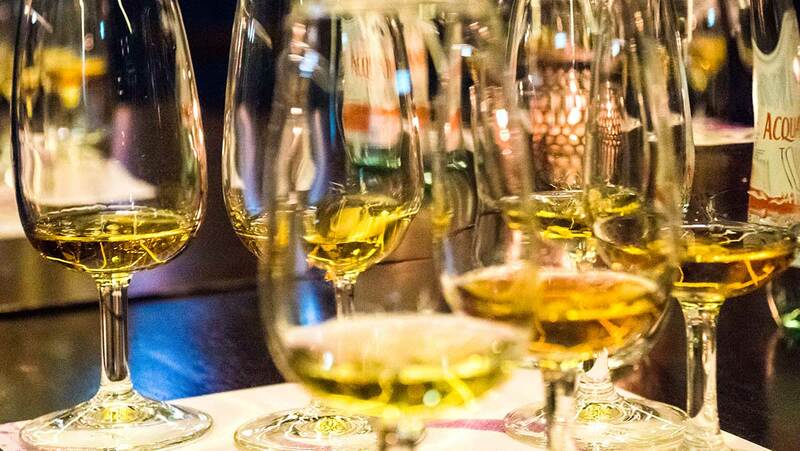 Our most popular #knowyourwhisky tasting experience is designed for the budding drinker, exposing them to six whisky varieties and decrypting insider lingo. Touching on what whisky is and how to drink it, this beginner-level tasting will introduce you to Bourbon, Scotch, Irish whiskey and more, familiarizing you with the basics and aiding you in discovering your own whisky preferences. Popular with stag parties as well as corporate groups, this tasting session typically lasts an hour. If you’re feeling a bit peckish, you can delve into something from the delicious foodmenu – the perfect accompaniment to an afternoon of whisky tasting – before moving on to the bar to enjoy the rest of your night at The Jefferson. Number of guests: Suitable for 1-4 guests. 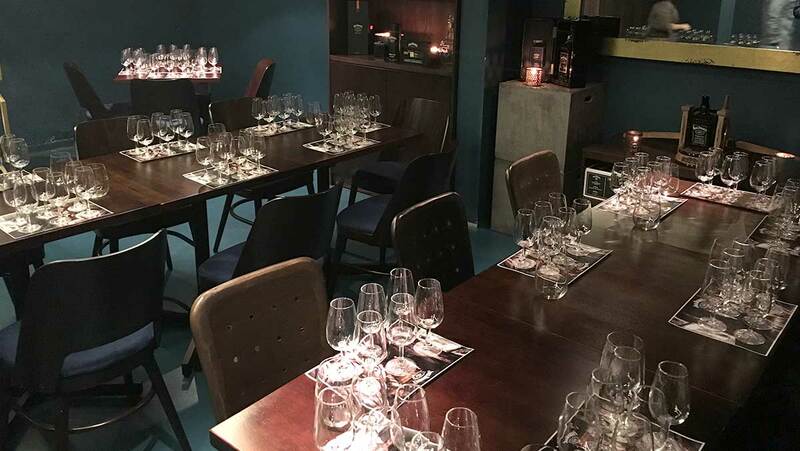 This is a casual, free-flowing tasting experience suitable for those who want to familiarize themselves with the ins and outs of the wonderful world of whisky. “Whisk(ey) me away to the J” is available at all times. Simply come and take a seat at the bar, and one of our expert barmen will be happy to share as much knowledge as time allows, guiding you through the 600+ whiskies that are on our shelves at any one time. Tasting serves are 15ml. You can sample as many whiskies as you like and have a say on which direction you would like the tasting to go, whether you are travelling between regions or distilleries. Please note that we recommend no more than 6 tasting portions, as we advocate responsible drinking. Number of guests: Suitable for a group of 5 or more people. Price: Price starts at $150 and final quote will depend on the whisky you would like to taste. For the more discerning whisky drinker, the ‘Bespoke Tasting’ is tailored to your own desires. If you wish to explore a particular region or variety, it’s an exceptional chance to draw from our extensive portfolio of rare, aged, and unique whiskies and bourbons, with even the most ardent aficionados likely to discover something new amongst our 600+ selection. To plan your whisky journey ahead of time, get in touch with us to discuss the whiskies on your list.